This spacious 3,500 sq. 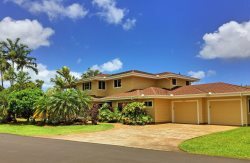 ft. Princeville home features 5 bedrooms, 4 baths with a two-level floor plan and a covered lanai overlooking the dramatic Hihimanu and Namahana Mountains and streaming waterfalls. Hale Makamaka is the perfect Kauai vacation rental for families and large groups alike looking for a convenient home near Kauai's North Shore beaches. Located less than one mile from the community park, local shopping, and restaurants. No expense was spared to ensure Hale Makamaka met both luxury and comfort for guests to enjoy. Featuring an extensive chef's kitchen to cater to the cook of the family, a media room equipped with a Smart TV, and a Smart TV in every bedroom, and a ping pong table for home entertainment. There are boogie boards, surf boards, stand up paddle boards, bikes, limited number of snorkel and fin sets, beach chairs and an umbrella available for guests to use and convenience. Although a mountain view home, Hale Makamaka is only a short walk from the Anini beach dirt path that takes you down to one of Kauai's most tranquil beaches. Or if you don't mind a short scenic drive, you are only minutes from some of the World's best beaches including beautiful Hanalei Bay, Anini Beach, Kalihiwai Beach, Secret Beach, Rock Quarries Beach, Tunnels Beach, Ke'e Beach.... and the list goes on and on. The Princeville community features paved sidewalks throughout, hiking trails, golf, tennis, spas, a community park with a playground, a library, and full shopping facilities including a super market, and food court with local restaurants. Princeville is also a golfer’s paradise at the Robert Trent Jones Jr. designed Makai Golf Course. Consider Hale Makamaka for your next Kauai family vacation, couples’ getaway, or corporate retreat. 5 Bedroom / 4 Bath - 12 Max Occupancy - Approximately 3,500 sq. ft.
Master Suite- AC, King bed, Fireplace, Walk-in Closet, Smart TV, DVD player. Gorgeous home and property. You can see the falls from the balcony. Clean home and perfect for a large family with babies and kids. Will highly recommend it. Would book with them again! "We had 10 people stay at this house and it was the perfect size. If you have kids then you could easily have 12-14 people since there is a room with bunk beds. The house was wonderful-- very clean and in a nice residential area; there was bikes, boogie boards, snorkeling equipment, surfing boards, etc. in the garage that our group used multiple times and we also loved the lanai! The house is close to Hanalei, Anini Beach and Queen's Bath. The only thing I would note is that if you are wanting to do a lot of things on the South Shore it is about a 2 hour drive so I would try to plan the majority of your things on the North Shore so you aren't driving too much. The host responded to all of our questions very quickly. Would definitely stay here again with a large group!" "This place was awesome! Would totally stay here again. The neighborhood was really great. The beach is walking distance, there's a grocery store less than 5 min up the road, and there's a small town about 10 away that you can drive to. Loved how the 2nd floor had the living room, kitchen, and deck. Was a fun hangout at night time where the family played games." "We loved our stay! The house is superbly equipped for cooking and I loved having good sharp knives on hand! A lot of great time hanging on the lanai, the three families had a good amount of independent space and we slept well. We did have one maintenance issue and found that the team was ready and able to help quickly, which was much appreciated. Definitely recommend!!!" "My family and I really loved this house and would recommend it to anyone with a large family. Tons of room and bathrooms for all! Thank you so much!!" "Our family had a wonderful time here! This place is very well equipped with amenities as described. There is AC in every bedroom, kitchen and upstairs living room. I would definitely stay here again if we ever needed a place this big." "This is a very nice house in a quiet residential neighborhood, fantastic for a group of 8-12 people if you prioritize a nice quiet neighborhood over being near tourist attractions. The master bedroom in particular is gorgeous and the ACs are great. This is a beautiful house that makes for a great place to stay and bond for any group that is large enough to take advantage of the accommodations."